"Sharan Edna Demmons, Westbrook College, Class of 1975"
Westbrook College student Sharan Edna Demmons, Class of 1975, was a Medical Assistant major and a Day Hop. 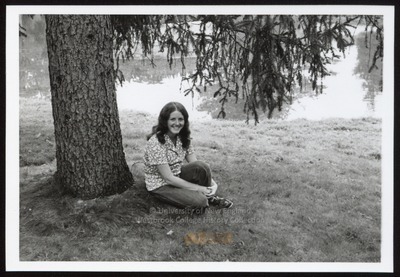 For her senior class candid photo, which appeared in the 1975 Tower Yearbook, she wore jeans and a short-sleeve, floral-covered shirt. Her hair was long and parted in the middle. Dark curls draped over her shoulders. Sharan sits on the grass at the base of a tree and beside a pond, very probably in Evergreen Cemetery by the Duck Pond.